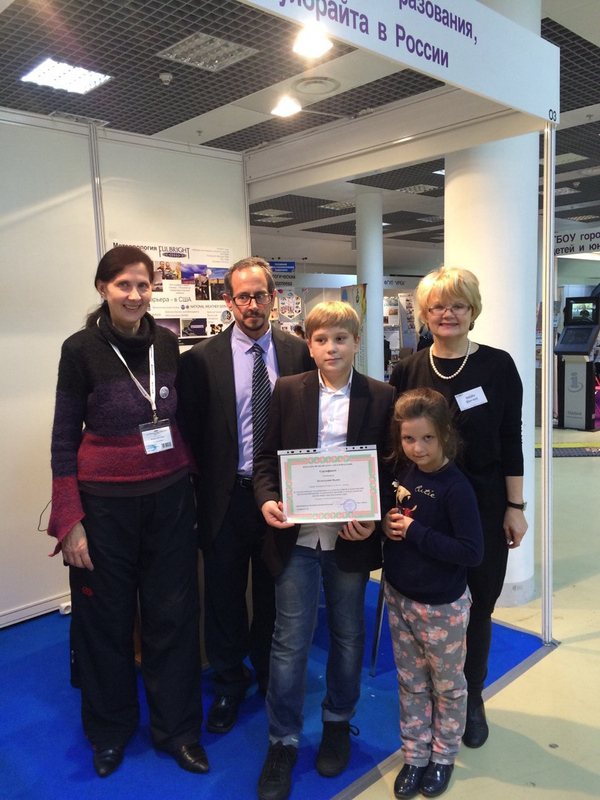 There were cities and towns where My Robot certificate/prize delivery was smooth and easy, as in Yekaterinburg where the 6th grader Sonya Rezvanova actually came with her mother to meet Jacob Boehmer at his academy, and he was happy that she took the time to come over to meet. 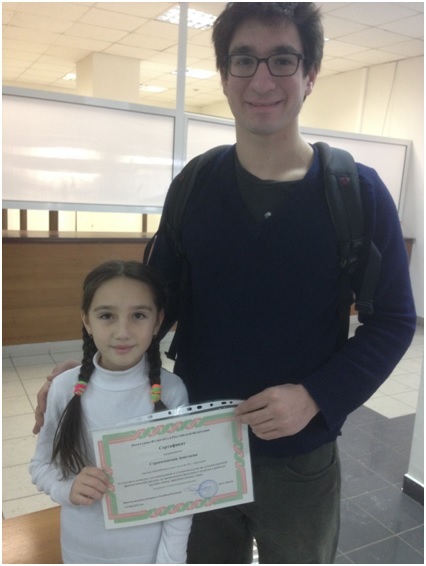 Likewise, Eric Connelly in Tyumen met with Liza Belova at his teaching institution, Tyumen State University. 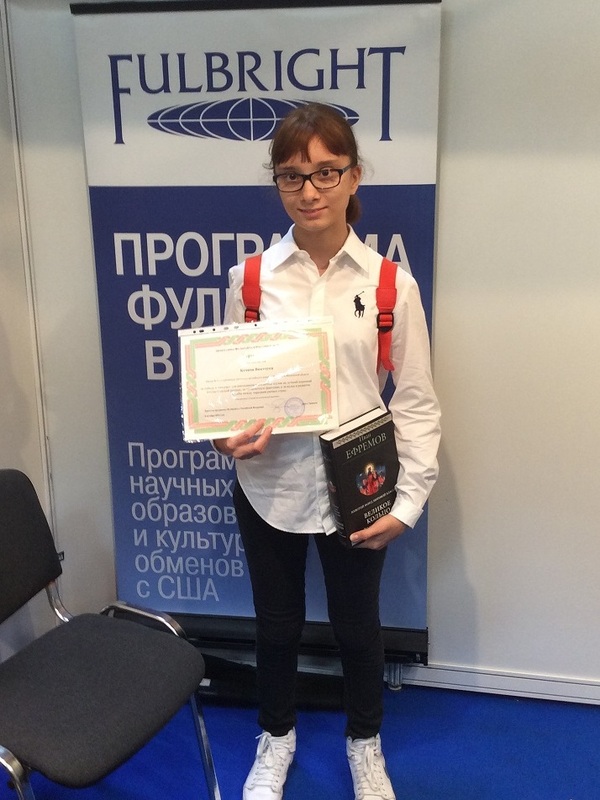 Moscow and near-Moscow residents, among them one of the contest winners Vika Kechina, came over to the Krasnaya Presnya Expocenter to receive the certificates and a book prize from the Fulbright Program representative, participants and alumni. Another contest winner, Tanya Kononova from Voronezh, met with the ETA Andy Swafford at her school; Tanya’s mother wrote to the program a warm thank you note for an interesting prize book. In Kazan, with four contest participants going to one and the same English Language gymnasium, Erin Harrington, a teaching assistant at Volga Region Sports Academy, took part in a regular school gathering, sort of a solemn line, where My Robot essay writers received their certificates of participation in front of their schoolmates and friends. Rachel Myers and Nicklas Blaise in Izhevsk met with the program participant Maxim Norin at his school and were impressed with his enthusiasm for writing. They spent some time at the school speaking with Maxim and some of the school administrators and teachers, and really enjoyed this meeting. This is how it all went, certificates and prizes being delivered, new people met, Russia becoming a little closer to the American students, and America getting more into focus for the Russian school children.